Mumbai: The second edition of the Serendipity Arts Festival (SAF 17) will be held along the banks of the river Mandovi in Panaji, Goa, December 15-22, 2017. This edition will feature over 70 art projects, including 40 projects that are commissioned specifically for the festival. The ground-breaking multidisciplinary arts festival brings together visual, performing and culinary arts, curated by eminent artists and creative collaborators, with the aim of “making the important interesting”. This year is all about scale and pushing boundaries – SAF 17 will be experimenting with site, form and display. Along with a line-up of scintillating programming spanning music, dance, theatre, visual arts, and culinary arts, this year’s edition is an unmissable spectacle of epic proportions. The festival will address issues such as arts education, patronage culture, interdisciplinary discourse, and accessibility of the arts. This exciting program of exhibitions and performances will be augmented by spaces for social and educational engagement. Practitioners and audiences will be able to interact with the arts and with each other on several levels, in an immersive space that seeks to create discursive opportunities, promote the exchanging of ideas, and inspire conversations about art as a means to shape public consciousness. In a marked change from the inaugural edition, this year the programmes will be dispersed across a mix of indoor and outdoor locations along the waterfront of Panaji. These venues range from historic Portuguese structures to modernist marvels, and include both indoor and outdoor spaces. Audiences will get to engage with the arts in beautiful, carefully designed, immersive and often-unconventional settings. Most venues will be within walking distance of each other and the festival will provide transit/shuttle options. Urban interventions and public art projects will transform the city into a vibrant and open cultural space. The Serendipity Arts Festival is a multi-disciplinary arts event set over period of eight days in December in the vibrant settings of Panaji, Goa. 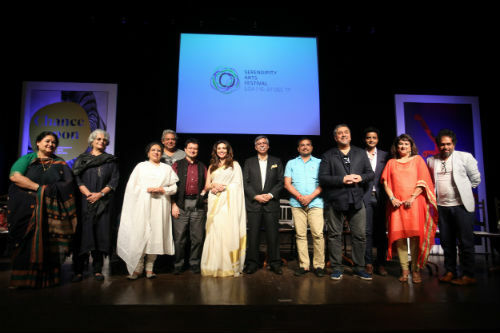 Curated by a panel of eminent artists and institutional figures, this festival is a long-term cultural project that hopes to affect positive change in the arts in India on a large scale. SAF 2017 will be back with a bang. This year is all about scale and pushing boundaries – SAF 17 will be experimenting with site, form and display. Along with a line-up of scintillating programming spanning music, dance, theatre, visual arts, and culinary arts, this year’s edition is an unmissable spectacle of epic proportions.